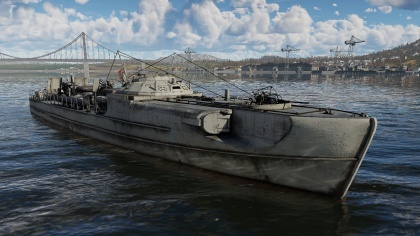 The Schnellboot S-100 (1944) is a Rank II German motor torpedo boat with a battle rating of 2.7 (AB/RB/SB). It was introduced in Update 1.79 "Project X" in the fleet closed beta test. The S-100 (1944), as with most vessels of the same type, does not have much in the way of armour. It has 12mm of hardened armour protecting the bridge, 8mm on the centre 20mm Flakzwilling cannon mounting, and another 12mm on the rear mount. Survivability is about average, with a slightly larger size helping with its crew distribution. The craft, as with any other like it, has a weak propulsion system, and thus can be immobilized by a nearby bomb or rocket explosion. All of the other components are average, with the ammunition providing a small area to hit, making ammunition detonations rare. As with most vessels, its gun turrets are rather weak, with the bow 30mm being sometimes knocked out after a simple frontal engagement with an enemy (though this is far more unlikely), and the larger 20mm turrets being frequent impact points of enemy fire. The S-100 across all variants is a very mobile platform, and this variant is no exception. The craft has a top speed of 78 kph, and a reverse speed of 23 kph, when spaded. The S-100 can generate plenty of thrust as it has 3 decently sized propellers, each connected to a 2000 hp Daimler-Benz MB-501 engine. From this, it has great acceleration and deceleration, being able to accelerate and decelerate fast enough to evade enemy fire and prevent collisions. It has a quick rudder shifting speed, being able to rapidly change direction to evade obstacles and fire, and is slightly better than most other boats of the same displacement. The primary armament consists of a single 30mm MK103/38 mount in a swivelling turret, situated at the bow (front) of the vessel. This mount can be easily underestimated, as the previous boats of similar design in the tree have had a much weaker armament placed in this mount, and thus it can be easily overlooked. However, this is a mistake. Given the BR the S-100 (1944) is positioned in, heavily armoured targets are few and far between, and lightly armoured craft are in abundance. This is the premise at which the MK103/38 takes its prey. The MK103/38 does not have an excelling fire rate, being slightly under average than other armament at its level. It also has a below average reload, feeling slightly sluggish compared to other armament, such as the 20mm MG C/38, which can be found on the same mounting on the previous boats in the tree. The ballistics of this weapon are nominal, with noticeably mundane trajectories which are easy to predict, a result of the higher caliber and thus better energy retention of the shells, however shots can be all over the place from the bad shot dispersion of the gun. As for the shells themselves, the HEIT shells featured in the clips of the 103' are deadly to even the larger spectrum of vessels to be encountered. These shells are prone to setting fires and inflicting thorough HE damage on a craft's hull and superstructure. The API rounds are also good for punching holes in an enemy vessel and blowing up inside. Given this, the best ammunition belt to equip the S-100 with would be the Universal belt, as it has a good balance between HEI and API; the HVAP rounds are not effective, as they over-penetrate without inflicting major damage. This weapon shows utmost efficacy in detonating ammunition stowage, so aiming for the front of enemy vessels, where it's placed on a lot of craft, is a viable strategy. All-in-all, a prestigious weapon. The secondary armament on the S-100 (1944) are two 20 mm autocannon turrets, one in the middle in a dual-mount and another closer to the stern in a quad-mount. Surface engagements: Surface targets can also be effectively engaged with the 20mm guns. As the main armament only consists of a single cannon, many find it more desirable to utilize the secondary armament with a more primary armament role. The reason players choose this is because of the greatly increased fire rate and mass of fire from the 20mm cannons over the 30mm. This results in the 20 millimetres being much better suited in the tactic of "spray and prey" than more precise shooting, due to the abundance of fire they produce. They can be useful, even when mainly using the 30mm, in situations such as when a group of lightly armoured enemies are presented , where a mass of fire is better suited to the job than the slow-firing 30mm gun. They can also perform well in close-quarters situations, where the 30mm may deplete its ammunition before and enemy is destroyed, and thus one can alternate between the former and the 20mm cannons. Anti-air engagements: The S-100 (1944) has proficient armament in dealing with air targets. It carries a total of six 20mm guns which all have broad fields of fire facilitating the engagement of enemy air targets. The 20mm guns are best used for anti aircraft purposes, as the 30mm can be used to take out most surface targets. These guns have adequate velocity, and do well in getting shots on target with abundant fire erupting from the vessel when an aircraft gets too close. However, it should be noted that these guns do not have good range, and usually project a high firing arc. The anti-air armament of the ship is made up of two 7.92 mm MG15 machine guns in two separate single-mounts on the bridge. The MG15s can be of limited use as they do not pack the firepower, or the lack of fire restriction, which the twenty millimetres have. The MG15s are almost useless against surface targets due to these limitations compared to the 20 mm. If anything, they are simply there to supplement the available firepower on the boat. 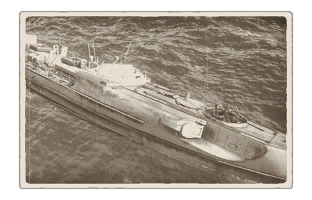 The S-100 (1944) carries two 533mm G7a torpedoes in tubes situated at the front of the craft, facing forward. The torpedo tubes are pointed almost directly forwards, with a slight spread to each side. There's a slight dead zone at the direct front the of the ship, which some craft can slip through, thus avoiding the torpedoes. The G7as, especially when the "Torpedo Mode" modification is researched, have substantially long range, and decent speed to boast. This allows them to strike enemies which are at a longer range to the battle, such as destroyers and cruisers, whom are sailing without change in direction or velocity. The S-100 (1944) has access to 6 WBD depth charges. Having these in its possession allows for niche use in laying "extra temporary mines", that is, in that they're similar in use to mines. The S-100's high speed can be used to reach enemy choke points and lay depth charges in hopes that an enemy will approach unbeknownst to the charge and be damaged by its blast, however this sees very limited practical use in combat. These depth charges are sure to become more useful in the future, however, as submarine gameplay is introduced. This page was last edited on 27 February 2019, at 19:27.